where fine dining and warm smiles abound! 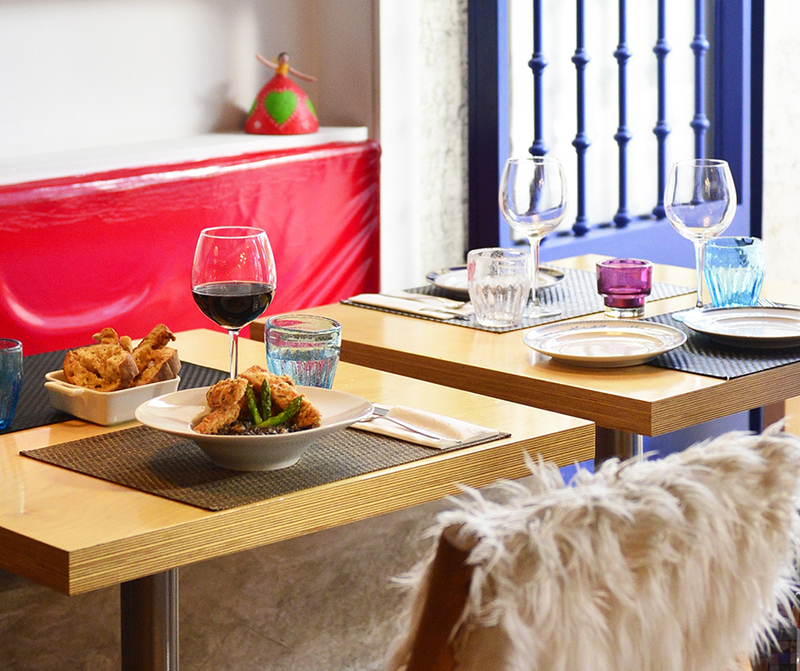 As you pass through the door and the big blue shutters, the restaurant’s good vibe greets you. 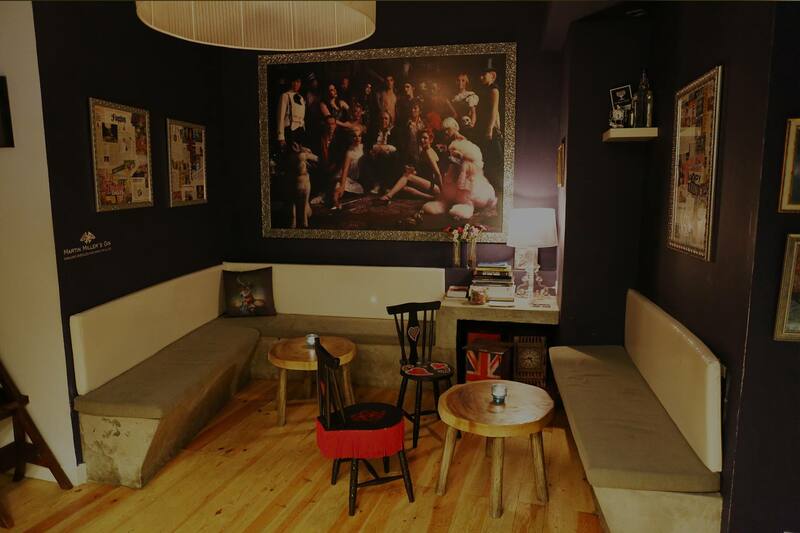 Whether alone or in group, the ambience is contagious and you immediately feel at home. 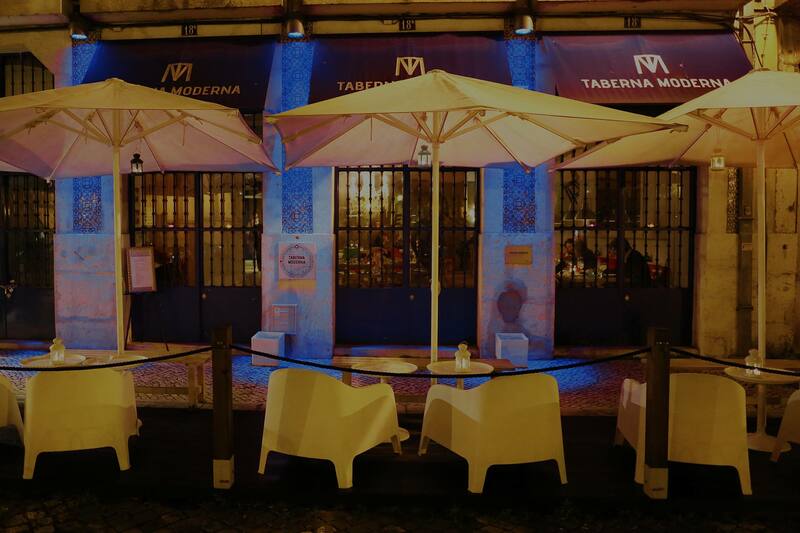 Taberna Moderna has already become a sacred space for a sophisticated clientele who savor more than 80 varieties of delicious gin cocktails. Whether sitting at a table or at our Bar Lisbonita, where lively and knowledgeable conversation reign, you will experience warm and attentive service and a dining menu whose quality and variety are unsurpassed. Try some of our dishes like black rice cuttlefish, ox, scallops, and braised tuna and you will know at first taste why our food has reached top status. Luis Carballo, the restaurant’s creator, is a caring host, and you can feel his expert hand in every detail: the music and unique decor, the seamless interaction between the restaurant and bar space, and the highest quality and presentation of each dish. Taberna Moderna combines the rich culinary traditions of the Iberian Peninsula and beyond, uniting them into a rich gastronomic experience. The cuisine team selects only the highest quality ingredients, employing expert techniques and minimal seasonings to enhance natural flavors in dishes made for sharing. 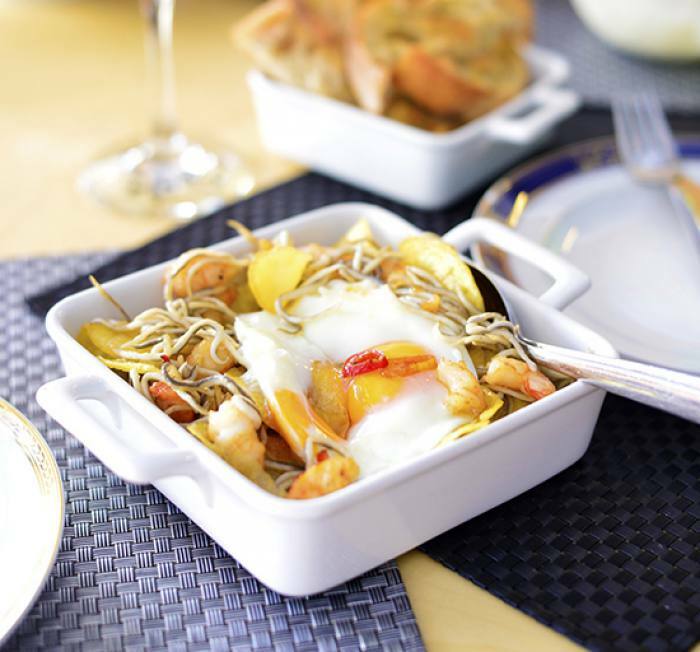 Specialties like Cuttlefish Rice, Braised Tuna, Poached Eggs, and Scallops Salad are already signature dishes, enthusiastically requested by our guests on every occasion. Our constantly evolving menu rotates or replaces dishes based on the season and the creative originality of our culinary team. It is a great pleasure for us to guide you through the menu and help you select a combination of dishes whose flavors, textures, and aromas will create an unforgettable meal. Bartenders whose focus is exclusively on your unique tastes. 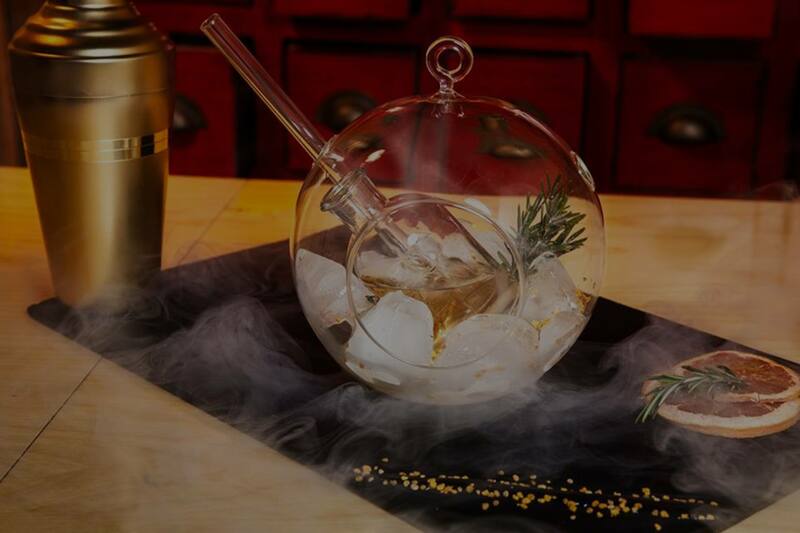 Whether your preferences are citrus, classic, floral, spicy or herbal, our bartender will select the perfect gin to create an individualized cocktail made just for you. With more than 80 types of gin—in 15 categories such as neutrals, bitter, sweet, or botanical–our bartenders can even make your next Gin & Tonic an unforgettable, unique experience. 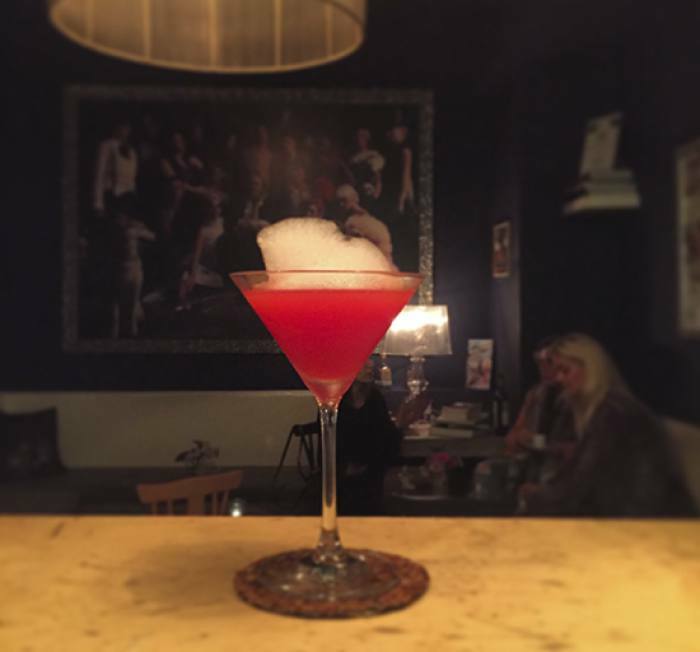 Whether you just want to enjoy a drink or you would to have our bartender design a special flight of gin cocktails to accompany different dishes at our restaurant, the bar is ready to meet your unique needs. 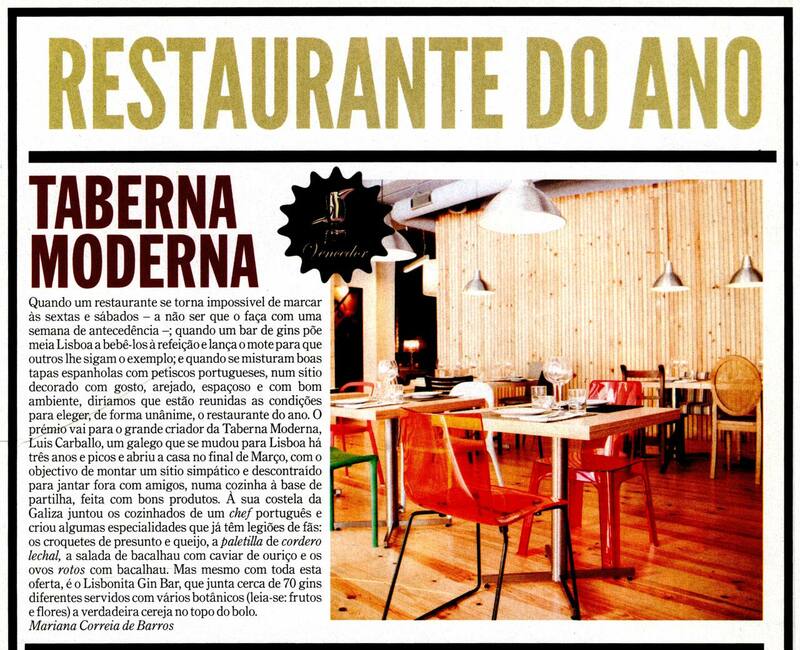 Taberna Moderna has been mentioned in reviews in almost all Portuguese newspapers and magazines. Acclaimed international magazines such as Elle Spain, Time, US Travel & Leisure, and Conde Nast Traveler have also praised us. Bloggers from all over the world speak often of our dishes, G&Ts, and service. 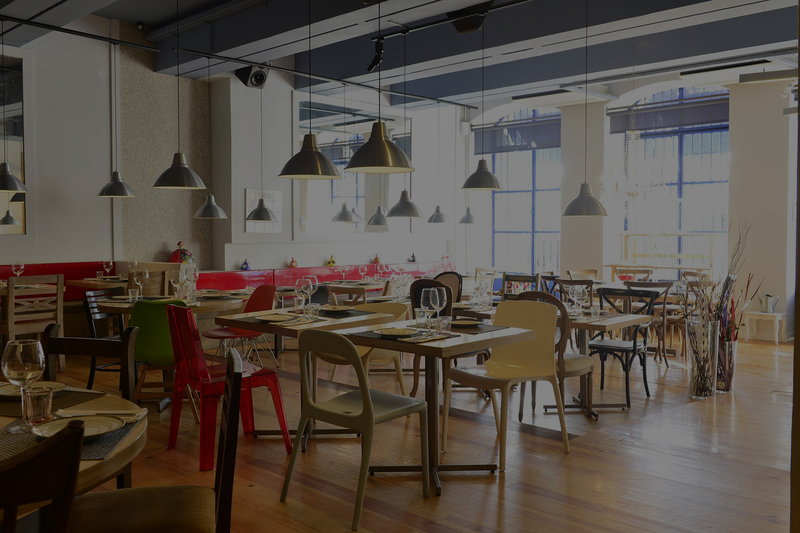 Taberna Moderna was awarded the Best 2012 Restaurant, by TimeOUT Magazine. 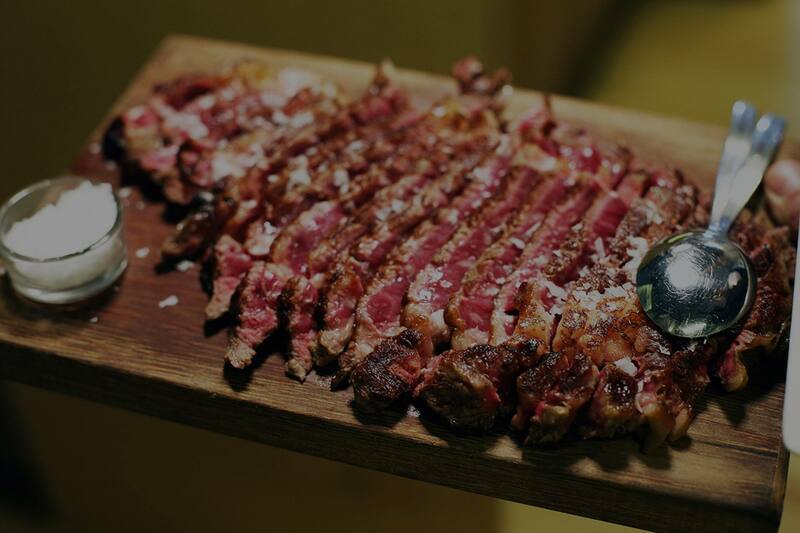 Nowadays the restaurant is in the Top 20 of the Best Restaurants in Lisbon, according to TimeOut, and TripAdvisor places it within the top 50 restaurants in Lisbon (out of more than 3,000).